Want to know where to keep up with Russian culture in the U.S.? Read the latest here. From celebrating Boris Pasternak and Abraham Lincoln, watching Alexei German’s last film and celebrating Maslenitsa, the next two weeks are full of cultural events for people of all tastes. Today isn’t only Friday but also International Bartender's Day, celebrated in Russia (in many other countries World Bartender Day 2015 is on February 24). This profession has a relatively short history in Russia, as in Soviet times there were few places for people to go out. But since the mid-90s Russia has been catching up with bar culture. Despite this everyone knows two Russia-related cocktails – the Black Russian and White Russian. Both of these cocktails contain vodka, the official minimum price of which went down this week in Russia. The Black Russian is a cocktail of vodka and coffee liqueur. This combination first appeared in 1949, and is ascribed to a Belgian barman, who created it at the Hotel Metropole in Brussels in honor of Perle Mesta, then U.S. ambassador to Luxembourg. It is said that the cocktail’s name is a reference to the darkest period of the Cold War between the USSR and the U.S.
A White Russian, meanwhile, is a sweet cocktail classically made with vodka, coffee liqueur (e.g., Kahlúa or Tia Maria), and cream served with ice. If you are not interested in getting some Russian culture through drinks, we suggest you go to the movie theater, as Feb. 6 is the U.S. premiere of the film Seventh Son by Russian director Sergei Bodrov, who currently lives in Los Angeles. It’s a Hollywood fantasy based on the novels by Joseph Delaney and starring Jeff Bridges and Julianne Moore. But if you are interested in more serious movies and live in New York City, Feb. 8 is your last chance to see Alexei German’s last film Hard to Be a God. The film is now receiving a belated American release at Anthology Film Archives in New York, with the late Russian filmmaker immersing us, without respite, for nearly three hours, in his reimagined Middle Ages. German spent more than 13 years (15 including pre-production) shooting the film, showing it to journalists and friends, editing, re-editing and perfecting it in post-production. Sadly, he never saw the result of his work, because he died in February 2013 and his son, who is also a film director, finished the production. A program of Alexei German’s earlier films is showing through February 10. Mid-February also sees the birthdays of Russian writer Boris Pasternak on Feb. 10 and former U.S. president Abraham Lincoln on Feb. 12. Mention of a connection between Lincoln and Russia may cause some to raise their eyebrows, but it actually exists. DC-based Russian historian Alexander Potemkin’s book The Tsar and the President explores the relatively unknown friendship between Tsar Alexander II and President Abraham Lincoln. In a series of powerful letters, the two leaders shared their thoughts and reflections, as well as a shared commitment to emancipation – of serfs in Russia and slaves in the United States. To celebrate Pasternak’s birthday we advise you either to read his Doctor Zhivago or the Peter Finn and Petra Couvée book The Zhivago Affair, about the CIA's involvement in the first Russian-language publication of Pasternak’s novel in the West. Film lovers can watch the iconic movie directed by David Lean, starring Omar Sharif and Julie Christie, which is marking its 50th anniversary this year. And for all Russian food lovers, a real pancake feast will start on Feb. 16, when the week of Maslenitsa (Shrovetide) kicks off. 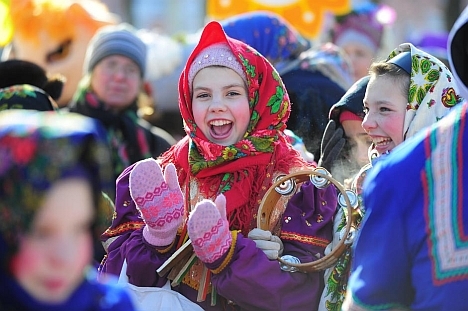 Instituted in the dim and distant past (like other self-respecting carnivals) and dedicated to the cult of fertility and ancestor worship, Slavic Maslenitsa survived the Christianization of the ancient state of Rus and entered the Orthodox calendar as the last week before Lent. The main feature of Maslenitsa is pancakes, which Russians make by a hundred different recipes: using sour dough and without yeast; rich and without eggs; from wheat, rye and buckwheat flour. Why not find out how to make beer pancakes in our article – and you still have time to organize a pancake party for your friends. Last year the RBTH multimedia team went to the ancient Russian town of Suzdal to celebrate Maslenitsa and we hope this video inspires you to take advantage of the week to plan something similar.